Eugene Parker is best known as the first African American sports agent. Parker was born February 24, 1956, in Fort Wayne, Indiana. He attended Concordia Lutheran High School and graduated from Purdue University in 1978. He received a J.D. from Valparaiso University School of Law in 1982. While at Purdue, Parker studied business management and also served as a four-year starter on the men’s basketball team, scoring 1,430 career points (currently #21 on the career list). He was a team captain for two years and he earned all Big Ten awards and the John Wooden Award as the Most Valuable Player for Purdue. ?? After his college career, Parker was drafted in the fifth round with the 108th overall pick by the San Antonio Spurs. He turned down his opportunity to play in the NBA to take a graduate assist coaching job at Valparaiso University while he earned a law degree. Following his collegiate career, Parker was selected for the 1978 US National Team while a member of the Athletes in Action; the US team finished the competition with a record of 3–4 and took fifth place.?? Parker decided against pursuing a career in professional athletics and instead founded in 1993 his company, Maximum Sports Management. His early signings included NFL All-Pro defensive players Rod Woodson and Deion Sanders. In 1995 Parker negotiated Deion Sanders’s lucrative seven-year, $35 million contract with a $13 million signing bonus, which made Sanders the highest paid defensive player in the NFL at that time. In 2004 Parker negotiated a six-year deal worth $60 million for wide receiver Larry Fitzgerald, making him the highest paid rookie ever in the NFL. 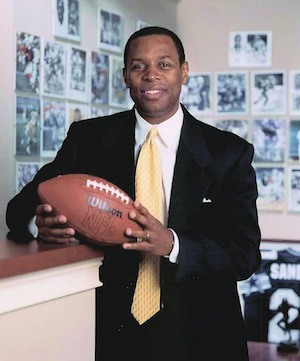 Parker eventually trained one of his first clients NFL player Roosevelt Barnes to be his business partner after Barnes retired from the league in 1985. Parker also groomed as an agent in his company, Craig McKenzie, a fellow graduate of Valparaiso University School of Law.?? In 2005 Parker was named by Black Enterprise Magazine as one of the top fifty influential blacks in sports, and was ranked forty-fifth in the Sports Illustrated list of top 101 most influential minorities in sports. In August 6, 2011, Parker became one of the only four sports agents to present a player into the National Football Hall of Fame when he presented his long-time client and friend Deion Sanders at a ceremony in Canton, Ohio, the site of the Hall of Fame. In 2012 Parker merged Maximum Sports Management with other top sports agencies to form Relativity Sports, where he was the CEO of Relativity Football.
? ?Eugene Parker, who was married to June (Richard) Parker and had five children, was diagnosed with kidney cancer in November of 2015. The disease progressed rapidly, and he passed away on March 3l, 2016 at the age of sixty in his home town of Fort Wayne, Indiana. Tom Pelissero, “Prominent NFL agent Eugene Parker dies at 60,” USA Today, April 1, 2016, http://www.usatoday.com/story/sports/nfl/2016/04/01/eugene-parker-agent/82505848/; Carmichael Funeral Service, “Eugene Parker’s Obituary,” Legacy Fort Wayne, April 10, 2016, http://www.legacy.com/obituaries/fortwayne/obituary.aspx?pid=179570955; “Prominent Football Agent Eugene Parker Dies of Cancer at 60,” ESPN, http://espn.go.com/nfl/story/_/id/15109712/prominent-football-agent-eugene-parker-dies-cancer-60; Indiana Basketball Hall of Fame, “Eugene Parker. Indiana Basketball Hall of Fame,” http://web.archive.org/web/20070927195237/http://www.hoopshall.com/inductees/2001/parker.html.